A Higher Level of Understanding within the Medical Field. The reason behind this is that everyone in the medical industry will start using a common language, thereby eliminating all forms of misunderstanding. It promotes specifics. Since each medical condition and body part has its own class and name, it will be easier for a doctor or surgeon to order his team about what needs to be done using very specific terms with the help of medical terminology. If you want to gain a full understanding about medical terminology, then know that Brainmeasures medical terminology certification program can provide you with a lot of help. 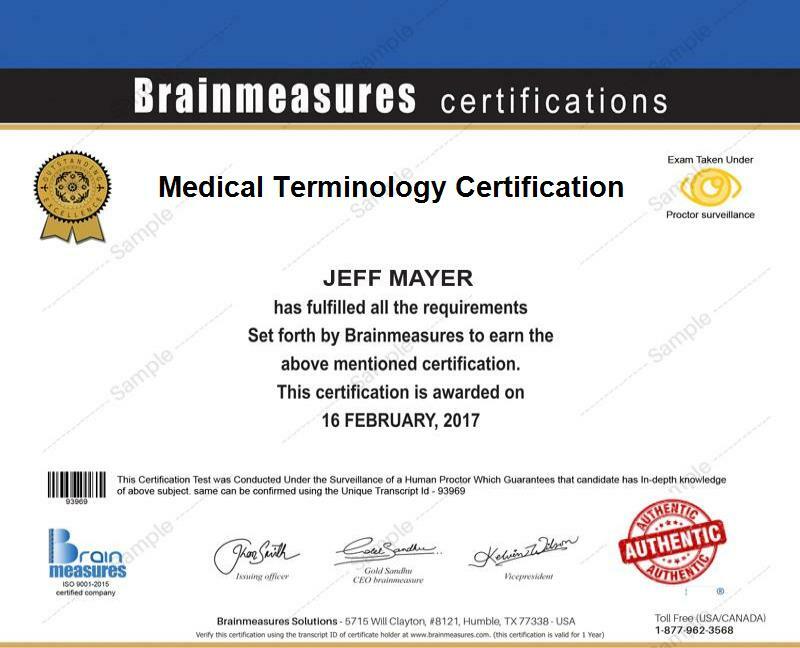 Enrolling in the medical terminology course offered by Brainmeasures can provide you with the highest level of security since this company is already recognized for its legitimacy, accuracy and reliability. By enrolling in the company’s medical terminology certification course, you will receive a well-detailed and accurate medical terminology training which allows you to become more familiar about all the prefixes, suffixes and word roots that are now used in the medical industry. With the help of this online certification course, you will be able to know the basics of combining words to convey meaningful health and medical conditions and comprehend their meaning and correct spelling. The medical terminology certification course offered by Brainmeasures is also highly comprehensive and accurate enough that you will understand all the terms used for the major systems in a human body including the respiratory system, urinary system, reproductive system, digestive system, circulatory system and skeletal system. The comprehensiveness of this certification course makes it easier for you to pass the medical terminology exam, thereby allowing you to finally take a hold of your certificate. The medical certification program offered by Brainmeasures aims to help anyone who is greatly interested about entering the medical industry. It helps aspiring professionals in the medical field especially administrative staff, reception staff, therapy assistants, healthcare assistants, clinic assistants, healthcare provider, medical records clerk and any other professionals who aim to improve their skills in clearly and communicating with their healthcare staff and patients using proper medical terms. Being a medical terminology certification holder is also very enjoyable since this will allow you to get a huge increase in the level of your income. Working as a medical terminology instructor after receiving your medical terminology certification is a huge help in increasing your income to as much as $65,000 annually. You may also work as a medical assistant and earn around $30,000 to $56,000 annually from it. If you decided to work as a medical transcriptionist, then you can also expect to earn a more stable flow of income. The good thing about being a medical transcriptionist is that it allows you to work from home and this is considered to be even more profitable. Home based medical transcriptionists can be expected to earn around $10 to $20 per hour with a possibility of huge increase and bonuses if their skills are already proven in this field.